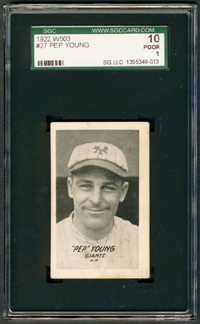 Ross Youngs was a star on four straight pennant winners for John McGraw's Giants in the early 1920s. He soon was McGraw's favorite and one of the game's best hitters. On the verge of greatness, in 1925 Youngs's skills deserted him and his average fell nearly 100 points. Diagnosed with Bright's disease, a terminal kidney disorder, Youngs gamely played one more season and died in 1927. 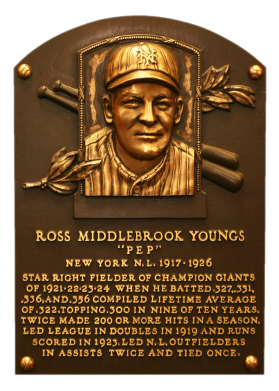 He had a .322 career batting average with 1,491 hits and 812 runs scored. Comments: My HOF wantlist has been pretty stable for the past few years. I know exactly what card I want or the upgrades I need for each member. The fun comes with tracking one of these down and having the funds available to pull the trigger. In 2013 things got tough and I was not able to nail down anything significant. But, in April 2013 I was just as excited about something I discovered/learned as if I had bought something. It really felt as good as purchasing something new. I've been at this collection for 15+ years, but I wasn't aware of any contemporary issues showing Ross Youngs in a portrait pose. My eBay searches have come up empty. I only see the few action issues depicting him. He only has a small handful of cards. I thought I'd be stuck with a 1981 Perez Steele tribute card I purchased in July, 2003 and had graded MINT 9 by PSA in May, 2004. 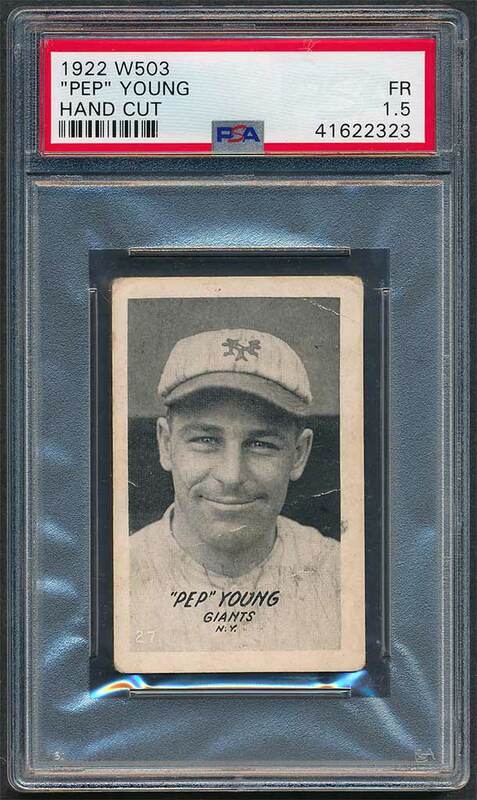 Then the REA Summer auction preview popped up and I saw the near complete 1922 W503 set. "Crap - that's Ross Youngs!" After some research I found out near sets have been sold before - approx $30K a few years back in a Lipset auction. Anyway, I didn't think I'd have a chance to buy the set for the one card. Before the auction, I knew Ross Young and Ross Youngs were one in the same. 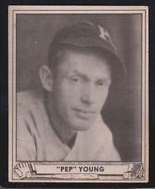 I was planning to modify my eBay search to look for Young, Youngs, Pep and Ross but exclude this Pep Young, pictured on the left (different player). Sometimes this hobby is pretty confusing! One of the tough things about the portraits in my collection is that I try and keep them diverse - with as many types represented as possible. My searches for "Pep, Ross, Young, Youngs" came up with the W590 and the W514 issues. I found these when I realized Pep was Ross. But, I already have the W590 issue represented by Frankie Frisch, and the W514 by Urban Faber. If I swapped them out, I'd have to find the player in an issue that wasn't already represented in the collection. I'm sure you can imagine the number of times I've swapped things in and out over the years with 250+ HOFers, and so many issues that consist mainly of action photos. This collection has taken lots of research. I'm finally at a point where I know what I want of each player. Well, with Youngs I got a little lucky! 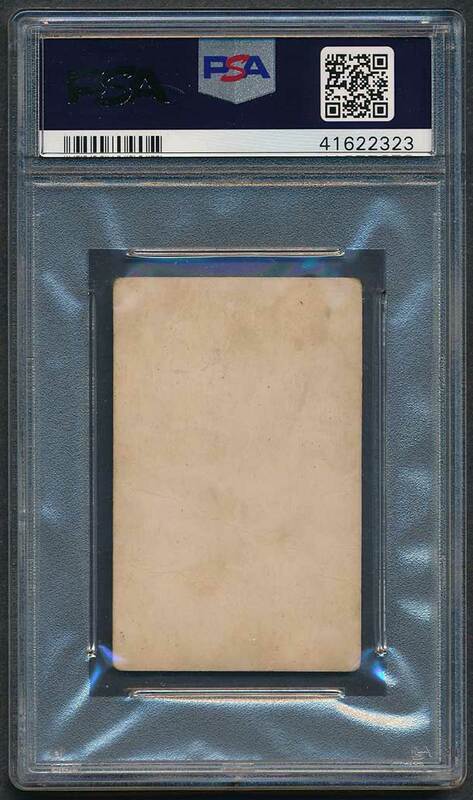 Fortunately, I was able to win the REA auction discussed above (May, 2013) and this one is now mine. I love replacing tribute cards with a contemporary issue, and a new type card to boot - my first W503!!! 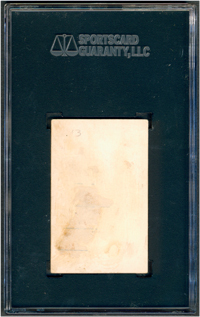 Description: Issued circa 1922, this 64-card set of blank-backed cards, measuring 1-3/4" X 2-3/4", feature black and white player photos surrounded by a white border. The player's name and team appear on the card, along with a card number in either the left or right bottom corner. There is no indication of the set's producer, although it is believed the cards were issued with candy or gum.